It’s been a very exciting winter. The decision was finally made to go into production on the first of four horseshoes under development. It would not have been possible without the help and support of Marcellus Metalcasters of Marcellus, Michigan. The Hilfling GrabIt was the design chosen. The GrabIt is off to the patternmakers shop to create a 2-up aluminum mold. The target for sale availability is the end of February. Initially, all sales will be through Ebay and PayPal. The GrabIt was approved for competition by the NHPA in November 2009 and will be licensed by the NHPA for the 2010 calendar year. 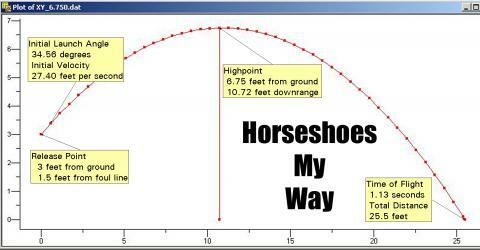 When I started pitching horseshoes in 2008, I turned the shoe from 40 feet. My age and a knee injury meant a move to 30 feet was in order. Almost immediately, I began experiencing the dreaded bounceback. Why did a perfectly thrown horseshoe bounce back off of the stake? I was determined to find the answer. Casio had just released the Casio EX-FC100, capable of capturing video at up to 1,000 frames per second. I made dozens of videos to record the impact of the horseshoe against the stake. I reviewed the videos from a large number of horseshoes. Some horseshoes had concave or convex ringer breaks. Some had none. I noticed that light horseshoes seemed to bounceback more frequently. The higher the horseshoe hit on the stake, the more the bounceback. There was nothing slowing down the horseshoe as it reached the stake. A simple horseshoe without ringer break offered the greatest possibility of bounceback. Some horseshoes had an area almost 2 inches long that could lead to a bounceback. I needed to concentrate on three areas — 1. weight; 2. slowing down impact; and, 3. modifying the back of the horseshoe. The weight issue was fairly easy. NHPA horseshoe specifications limit the weight of a horseshoe to 2 pounds 10 ounces. Reducing impact speed required the horseshoe to hit the stake as early as possible in it’s flight. The final requirement was to try to eliminate any squareness to the line of flight. Problem 1 — I decided to make the weight close to the limit of 2 pounds 10 ounces. Problem 2 — How could you slow down the flight of the horseshoe and re-direct it to a specific location? The Parabola was the answer. The next challenge was to find the formula that produced the correct Parabolic shape. It is the parabola that directs satellite signals to your receiver. That was a bit harder since I had to respect the shape requirements of the NHPA specification. However, a shape was found that placed the focal point just in front of the ringer break. Problem 3 — solved by placing two catches that did not have any point square to the line of flight. A bonus feature that became apparent in slow motion was the tabs on each end of the parabola actually move the stake out of the way and snap back when the horseshoe reaches either the left or right catch. So, here’s how the shoe works. If the stake hits the left or right side of the horseshoe it will slide or bounce into either the left or right catch. If the stake hits either tab, the tab will drive the stake out of the way and snap back when the horseshoe reaches the catch. If the horseshoe misses the sides or tab, it will be deflected by the ringer break into either the left or right catch. If the horseshoe hits about midway up the stake, the horseshoe will rotate left or right depending on which catch the stake enters. This was the genesis of the Hilfling horseshoe design. The Viking, GrabIt and FlipOn all use these basic concepts. There was one final aspect of design — the center of gravity. I decided that due to the closeness between the approach and stake for the 30 foot pitcher, it was necessary to move the center of gravity so that the horseshoe began it’s rotation early. There you have it. Why did I pick the GrabIt over the Viking? — I noticed that periodically the horseshoe would rotate slightly to the right, after release. A slight rotation was a good thing, too much was bad. It was apparent that something in my grip was influencing this rotation. Using my laser pointer previously described, showed that the third pad of my index finger was causing this slight rotation as my fingers came off of the shoe and pressed against the outside of the shoe. This tendency was also apparent when I had the various testers try the Viking. The smaller the hands, the more the rotation. I decided that I needed to change the shape of the back of the horseshoe and move the space between the index and middle finger closer together. Those two changes corrected the problem. It is important that the user of the GrabIt, Viking and FlipOn understand this tendency when first trying any of the shoes. Explaining this tendency before each tester began, alerted them to what caused the problem and how to avoid it. I have long wondered if it was possible to alter the flight of a horseshoe by moving around the center of gravity. Early on, I experimented with a shoe that rotated 1/3 turn by holding the shoe at the right hook. I had limited success, because trying as hard as I could, I could not stop the shoe from arriving with the point of the hooks hitting first. I couldn’t seem to get the shoe to fly flat. So, I had a horseshoe made that would permit me to move weight around the perimeter of the horseshoe. It permits me to move the center of gravity left, right, forward or back and variations of each. Within a short period of time I was able to move the center of gravity such that I am now able to hold the shoe at the right hook caulk, rotate it 1/3 turn and fly perfectly flat. Does that mean that it is possible to create a horseshoe that is designed specifically for your personal grip and release? — I believe so. I have decided to investigate how changes in the location of the center of gravity affects the flight of a horseshoe. I needed to come up with a way that could release the horseshoe the same way every time. It also needs to be able to release the shoe from any height and the corresponding initial velocity. I am trying to determine how to design a horseshoe that will flip on it’s own, arrive open 5-10 degrees and over flip slightly so that the back of the horseshoe hits the ground first. It’s a fun project. A couple more components and I’ll be ready to put it together.